This guest post is by Jill Sulam, owner of Transformations Editing. I dislike talking on the phone—and that’s putting it mildly. As an editor and writer, I prefer to communicate by email if face-to-face conversation isn’t practical. That’s probably the primary reason I’ve never been particularly interested in cell phones. I got one in 2000 only to appease my parents, who were concerned about my safety when I was out and about. I held on to that phone for more than five years but used it so infrequently that, under pressure, I could not recall my own phone number. About four years ago, I finally replaced that heavy, monochrome-screened model with a petite LG flip phone, which appealed to me mostly because it was, well, cute. After a couple of years, though, I found it wasn’t holding a charge for long, and Jeremy pressed me to get a new phone. I put it off—what could be more boring than looking at cell phones?—but eventually picked up a purple Motorola phone with more sophisticated graphic capabilities. So far, it holds a charge nicely. I can make and receive calls and send text messages. What else do I need? Well, I’m starting to think that I need to be able to read and send emails on the go. As the owner of Transformations Editing, it’s important for me to be able to stay in touch with clients and prospective clients when I’m out during the day or on vacation. I have a laptop that accompanies me on most sojourns, but I’d really like something more portable—something that isn’t 15.4 inches diagonal and that doesn’t require an adapter the size and weight of a brick—for those quick but necessary email checks. I never thought I’d say this, but I think I need a smartphone. Okay, maybe just a sort-of-smart phone. One that I can use to check and send email and write text messages without having to painstakingly press each key three (or twelve) times. I'm a clumsy typist, so virtual keyboards are out. One implication of having such a phone will be constant availability. I usually keep my cell phone turned off when I’m out doing errands because, frankly, I don’t always want to be reachable. Will having constant access to my email cause me to become the kind of person who stops in the middle of grocery shopping to reply to messages right away? Isn’t it good to step away entirely from work sometimes? To focus as fully as possible on the task at hand, even if that task is selecting yogurts or trying on jeans? Well, it looks as if, when my two-year anniversary with that purple Motorola rolls around in June 2011, I’ll at least check out the semi-smart phones offered by my carrier, Verizon. Any recommendations? Think cheap, reliable, easy to use—and preferably cute. 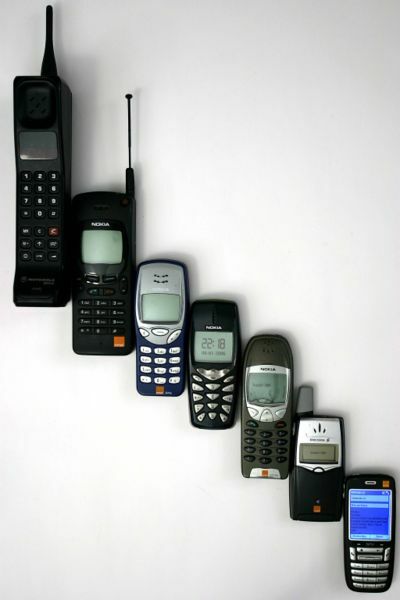 Image credit: Mobile phones: Wikipedia. I think you could try and replace your laptop with a tablet. You said that your laptop is heavy and uses a lot of space. A tablet is really small and light. You also said that virtual keyboard is an issue, there are keyboards for tablets that you can easily use. I am using an iPad and it is great, by the way I am also developing for it (the app will be sg. similar to the following one: http://www.voip-sip-sdk.com/p_457-voip-iphone-integration-voip.html). There are numerous tablets out there, Android tablets and iPads. There is the Samsung Galaxy Note 2 that uses the so called S Pen that you can use for writing, just like using an ordinary pen. I hope the shared information will be useful for you.